Wildlife in Australia is unique and fascinating. 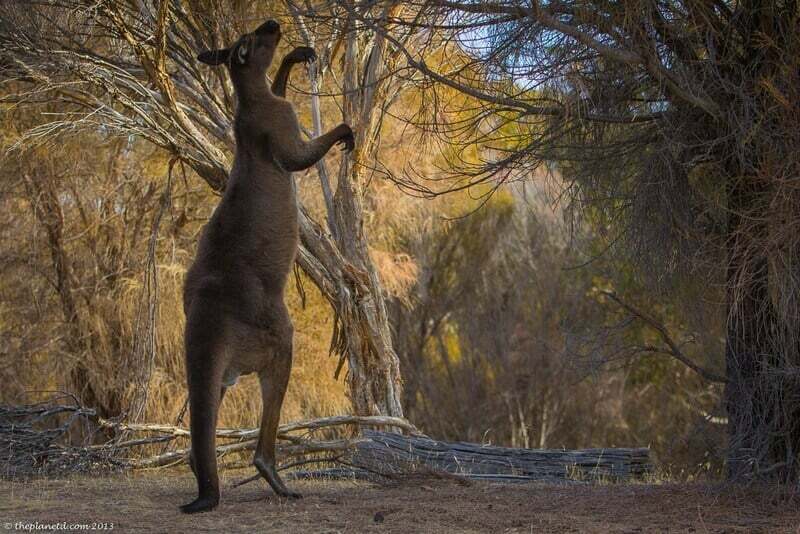 Nowhere else on earth can you find kangaroos and wallabies or koalas and dingoes. 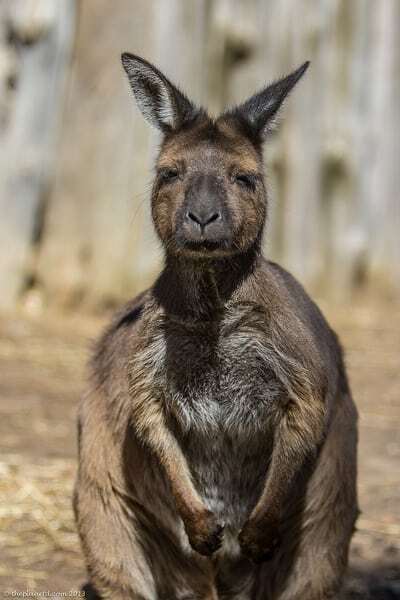 While there is a bounty on many an animal's head in Australia, there are some wildlife sanctuaries on Kangaroo Island who give comfort and homes to animals in need. It's difficult to wrap your head around all the culling that goes on in Australia. It seems to be talked about on a regular basis, but with the mess that the early settlers left the country in, one can understand why. 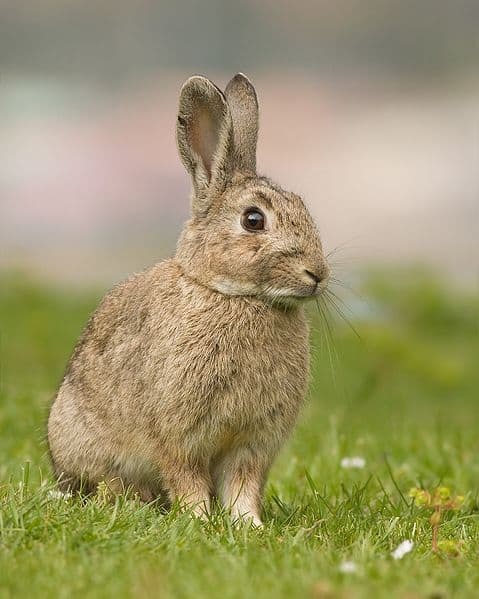 Australia was decimated by rabbits during the rabbit plague years ago and many other invasive species brought in by Europeans like ferrel goats, the cane toad, the fox and the ferrel cat have done a lot of damage to the environment. Australia has a very fragile ecosystem due to some bad choices made by early settlers. In today's world, hunters are hired to keep invasive wildlife populations down. But with the fragile environment, even native animals like kangaroos have become a victim of this culling culture as well. There are an estimated 50 million kangaroos in Australia competing for food and water with livestock around the country. There really isn't enough vegetation for everyone and it is said that Australia's hunters kill approximately 5 million ‘roos a year. We've heard from people that if Kangaroos aren't culled, they end up dying a slow and painful death near the end of the dry season due to lack of water. We did see evidence of this as we drove through parts of the Outback on the mainland. Kangaroos carcasses were scattered in the area where they simply died of thirst. It's a sad sight and even though the Aussies cull kangaroos, that doesn't mean they want them to suffer. How cute is he? We don't want him to suffer. There are many people who love wildlife in Australia and we saw evidence of this all over Kangaroo Island in South Australia. While a person will have many animal encounters in the wild on Kangaroo Island, there are a few places where injured or orphaned animals are brought to live out their days or be rehabilitated back into the wild. While nothing compares to seeing an animal in its natural habitat, it is also uplifting to see people taking care of animals who need our help and to give us a chance to see them on a more up close and personal level. 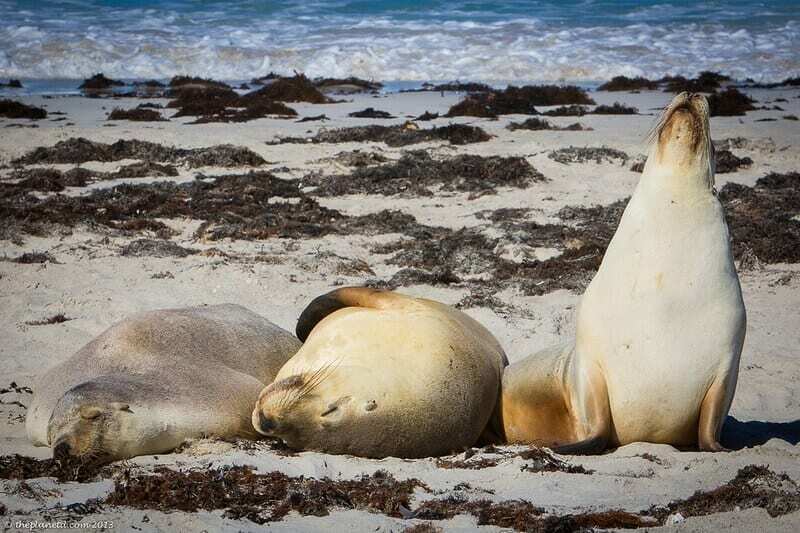 Here are a few of our favourite Wildlife Encounters at animal sanctuaries on Kangaroo Island. 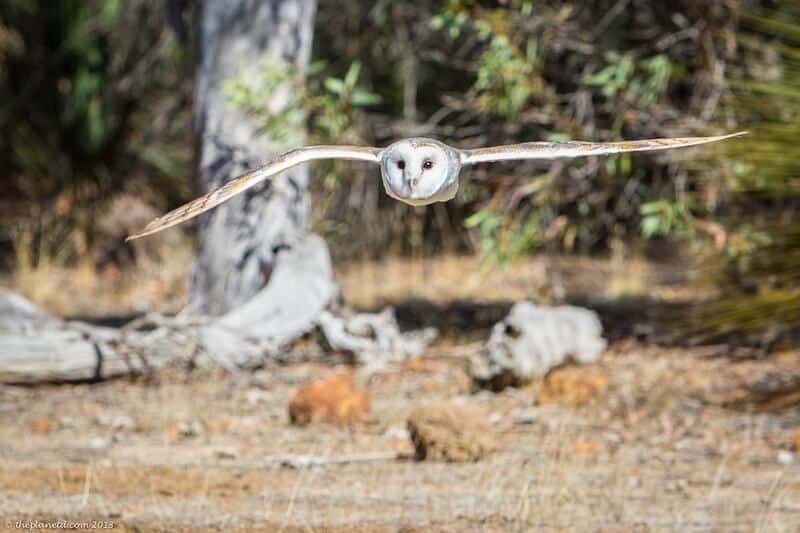 The Kangaroo Island Birds of Prey show gives you a chance to learn about birds native to Australia. Here, they rehabilitate birds that have been hurt or injured and use birds who can't go back to the wild in their shows. These birds seem quite happy and had very distinct personalities. It also seemed that they had a strong bond with the staff who is very passionate about wildlife. You know that the owners have a passion for wildlife, it's run by Dave and Leeza Irwin (yes that Irwin). Dave is the cousin of the late Crocodile Hunter, Steve Irwin. A love for animals run in the family and you know you're contributing to something good when you go to the Birds of Prey. My favourite moment came when we all yelled “Casper!” That's the name of the barn owl that is a part of the show. When we yelled his name, he popped his head from his tree and then flew onto the stage. What a cutie, he seemed so curious and smart. We had the chance to give casper a little pet and he seemed to love every minute of the attention. 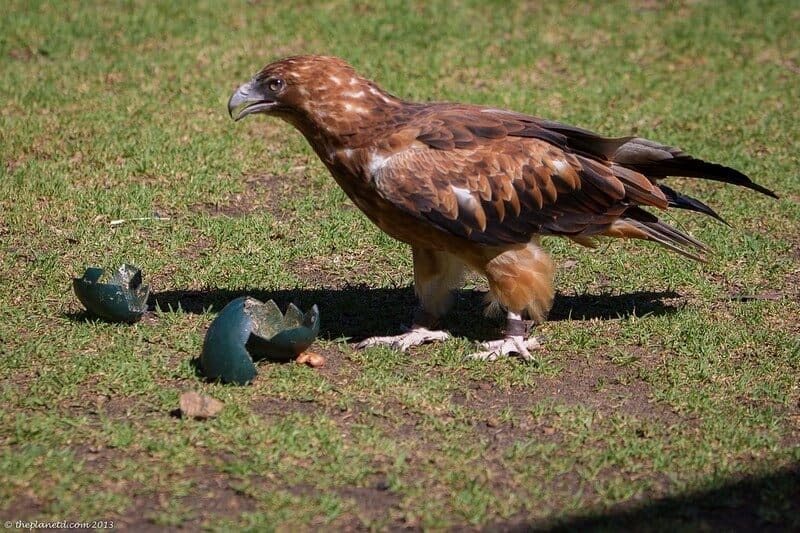 Another great moment was when a raptor pecked open a fake giant egg to get at the meat inside. The sanctuary tries to simulate the natural environment as much as possible and fulfill the instincts of the bird. This raptor was found as an orphan and didn't have a mother to teach him how, and yet his instincts tell him to break open the egg. It was at the sanctuary that we had the chance to see our first kookaburra. Most people in the audience were Australian so they weren't overly excited, but for us Canucks, we loved it. If you see one show on Kangaroo Island, make sure it's this one. To provide the best possible care for orphaned, sick and injured birds of prey. To return as many recovered birds to the wild as possible. To enhance public understanding and appreciation of raptors through public programs, tours and educational free flight displays. Research into environmental factors affecting birds of prey. While we had dinner that night at the Seascape Lodge, we made our dining companions green with envy when we told them about it. Two of them opted out of seeing the raptor show because they've seen them in the past and weren't interested, but when we told them all that we did, they regret not taking advantage of it. We admit, we thought the same thing before going. We had seen a bird show in Ecuador that didn't come close to being as good as this one. I'm glad we went. I remember writing a post about Kangaroo Island and someone told us on twitter that they didn't see one kangaroo while there. Well, their first mistake was not going with a guide. 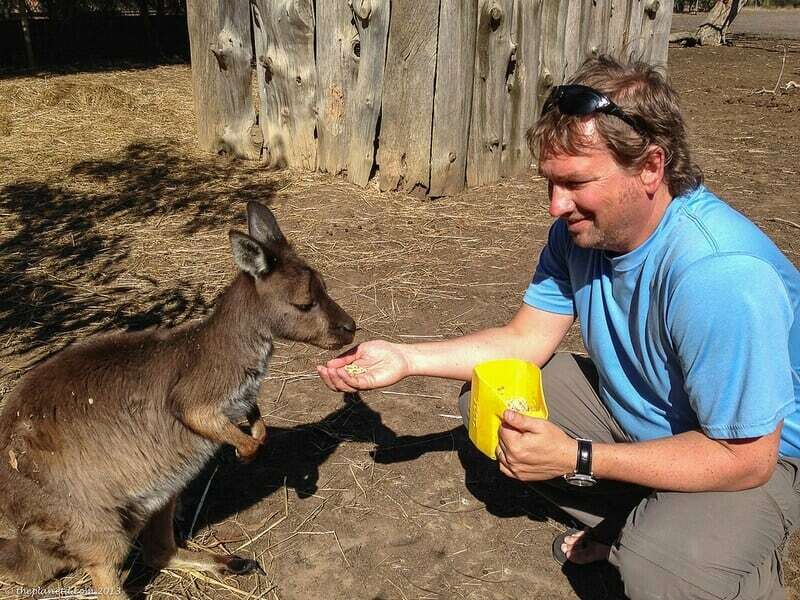 Terry, from Kangaroo Island Wilderness tours knew exactly where to see Kangaroos in the wild. We walked with him through a conservation area and saw many kangaroos hopping around, reaching high into trees for fresh leaves and laying down in small groups. It was amazing to be able to walk among them. But we also got to visit kangaroos at a Wildlife Park. At this park, they take care of injured, orphaned and unwanted animals. Terry told us that many people are always bringing kangaroos to the sanctuary. Once they get a kangaroo turned in, there's no putting them back in the wild, so they live out their days in a big corral. They seem pretty happy though, they have shade and food and water and are in a wide open space. There's lots of room for them and you can enter the corrals for a visit. Make sure to buy a bucket of pellets to feed the kangaroos. It is adorable to watch them perk up when you enter the corral. You'll have them eating out of your hand in no time. If you haven't had any luck spotting koalas, it is here that you will get your chance to see them up close as well. They do offer opportunities for you to go into the enclosure to capture that perfect photograph. But make sure you follow the rules and don't touch. Just like koalas in the wild, these little guys sleep a lot. They don't seem to even notice the people and they also look very comfortable in their own personal trees. Yep, I think these koalas are happy campers. See Parndana Wildlife Park for more details. If you want to see Koalas in a more natural habitat, a visit to Hanson Bay Wildlife Sanctuary is a must. It's known for the famous Koala Walk, where you are guaranteed to see Koalas relaxing in the Eucalyptus tree. 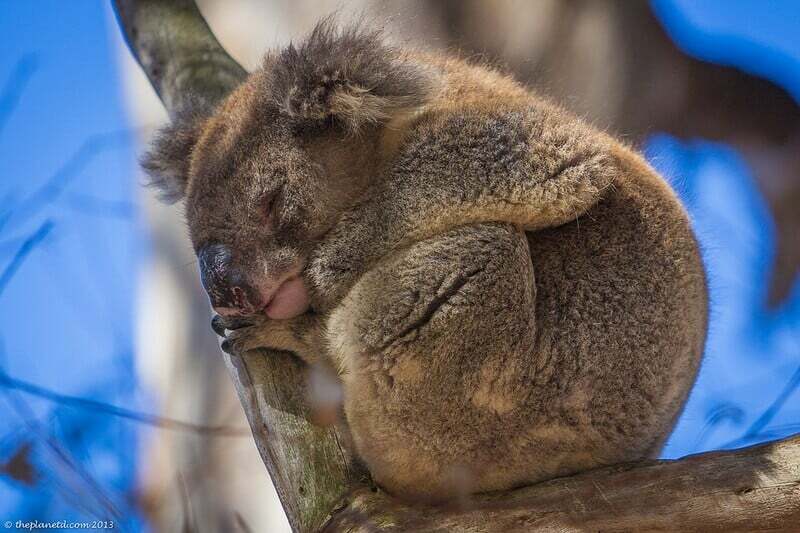 Relaxing is the key phrase here, Koalas sleep 20 hours a day! The sanctuary has many eucalyptus trees and it's a comfortable escape from the heat as you walk through the shade of the trees. Koalas are difficult to spot, but if you are having troubles, don't fret, if there have been koala sightings earlier that day, they'll have markers set out for you to have a look. Instead of having to look up in the trees for the koalas, you can scan the premises for the yellow signs sitting below a tree where the koala was sighted. We didn't want to give in to following the signs, but after no luck, we gave up and took a look. Sure enough, there were koalas sleeping in a tree above every marker. Now that's easy koala hunting. It's not just land dwelling animals that are under threat, Australian Sea Lions are endangered as well. At Seal Bay, a breeding colony of sea lions rest and relax on the sandy beach. There is a boardwalk leading down to the beach where you can walk within metres of the sleeping sea lions. Mothers leave their calves as they go out to sea for days to hunt. In the display area, there were diagrams showing how far seals dive and they can go as deep as 100 metres. How do we know this? Tracking devices of course. Seals work hard and have a difficult life, but they certainly love to play. It was a treat to watch them body surf on the crashing waves, sniff each others noses and sleep in groups to keep each other warm. A ranger will take you for a guided walk to tell you all you need to know and show you the best places to view the sea lions. Make sure to not get too close. Unlike the other sanctuaries of kangaroo island mentioned above, this sanctuary is protecting wild seals who are free to come and go. While it would be wonderful to never have to have any wild animals in captivity, that is not the way of our modern world. Conservation areas and national parks are a good start in protecting our wildlife and their habitat and wildlife sanctuaries are giving animals a safe and comfortable environment for those who cannot be reintroduced to the wild to live out their lives. We found that these wildlife sanctuaries of Kangaroo Island all cared for their animals and had a passion for conservation and education. Let's hope that the next generation has an abundance of wildlife to see and experience just like we have been so lucky to witness in our lifetime. Our trip to South Australia was courtesy of South Australia tourism. 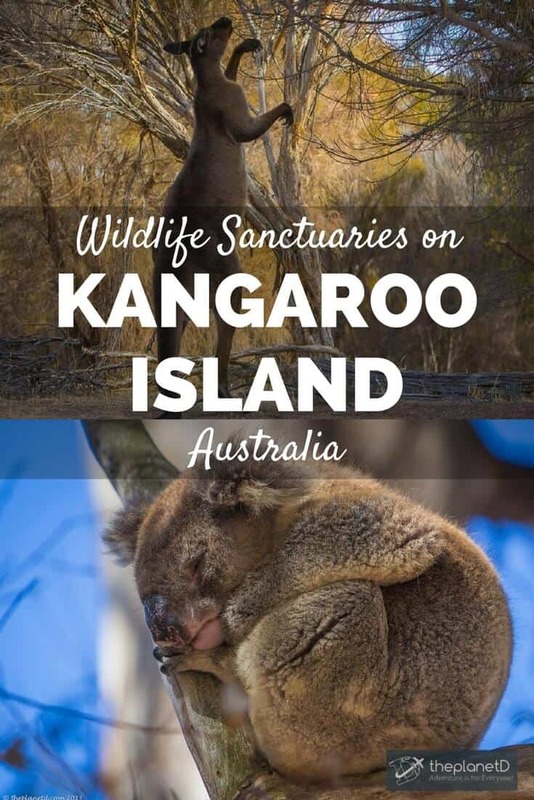 16 Responses to "Kangaroo Island Wildlife Sanctuaries"
So glad we could inspire you to go to Kangaroo Island, it’s a truly incredible place. 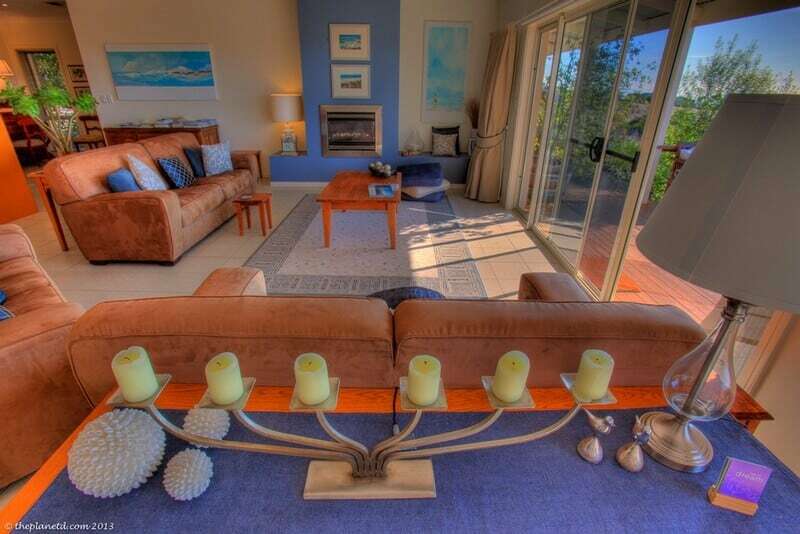 I want visit this true wildlife sanctuary, variety of coastal scenery & prolific wildlife. I love to play with kangaroo and Koalas. KI is so high up on my bucket list. I am stoked to be finally going there this Jan. I think we are going to put our feet up there for at least a week and just enjoy the serenity. Those are adorable animals especially the kangaroo, he’s smiling in front of the camera. Haha. I am just dying to see koalas! They are so stinkin’ cute. They are! You just want to give them a big cuddle, but you can’t so you just have to say Oooh So cute! Wow! Quite the variety of wildlife to be seen. All of it looks like a lot of fun and you certainly got some really great photographs too. The seals have to be my favorite, but it’s a tough call. That place looks awesome! So far I’ve only ever been to Frazer, Lizard and Hamilton in the GBR. Aww…they look so cute! Especially the koala. Indeed when we talk about Australia, first name that comes into our mind are indeed kangaroos. It is interesting to know that there are 50 millions of them and counting. 5 millions of them are slaughtered just to maintain the stability in the food chain. Never knew about this interesting statistics.